Natural gas extracted abroad is liquefied at -162°C and transported by tanker as LNG (liquefied natural gas), with a volume that is one-600th of the gaseous form. Tokyo Gas produces city gas at the Negishi, Sodegauwa, Ohgishima and Hitachi LNG terminals, and we supply city gas by ensuring the terminals back each other up. Since little energy is used, the energy efficiency in producing city gas from LNG stands at 99% or more. Energy loss is also extremely slight in city gas supply because it is transmitted directly through pipelines to consumption areas. We are making further efforts to save energy, such as by using LNG cold energy. Using cold energy of -162°C LNG at various temperatures, we engage in cryogenic power generation, operate cold storage warehouses and produce dry ice. 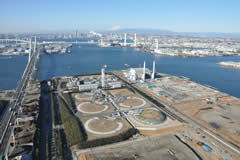 The Negishi LNG Terminal depends on cryogenic power generation for about 38% of its power consumption. In fiscal 2017, it generated 32,024 MWh of electricity, using cold energy of LNG, and reined in CO2 emissions by about 22,000 tons. *Boil-off gas is generated by evaporation of LNG due to heat entering tanks. Methane accounts for less than 1% of the Tokyo Gas Group’s greenhouse gas emissions. It is released mainly during city gas production and gas pipeline construction work. The Group strives to further reduce methane emissions by, for example, cutting the amount of sampling gas used in analyzing produced gas, preventing venting during the shutdown of a calorific value adjustment system, planning pressure reductions to curb methane emissions into the atmosphere during pipeline construction work, and developing gas absorption and recovery systems.